For Transformers, different characters being represented by repaints and/or remolds of the same figure is basically one of the pillars the whole series rests upon. And while this intrinsic part of the franchise is sometimes derided, it can also bring a genuine feeling of giddy anticipation. The arrival of the excellent Masterpiece Ironhide brought with it the knowledge that his fellow van man wouldn't be too far behind. Ratchet is one of the most memorable Generation One characters, with a version of him appearing in several Transformers series. As either the jovial doc-bot in the cartoon or the reluctant hero in the Marvel comics, the Autobot's chief mechanic has been fixing for a Masterpiece toy for a long time. Now, let's check under the hood to see if TakaraTomy has kept this mold in good working order its second time around. As expected, Ratchet is pretty much the same as Ironhide while in van mode. He's a whole lot of robot packed into five and a half inches of a boxy Nissan Cherry Vanette ambulance. Like Ironhide, almost every bit of color on this figure is done with glossy paint applications, making Ratchet a very shiny van. The simple white body with red stripes along either side is accurate to a real life Japanese ambulance (kyukyusha), though our Ratchet never had kanji on his chassis the way his Diaclone predecessor did. Admittedly, the white coloring makes all the panel lines necessary for the toy's transformation more noticeable. That said, I find this is much less distracting in real life than it is in photographs. Putting the two van bots side-by-side conjures up fun memories of the cartoon show, in which these valiant Autobot vans would roll into battle. True to the G1 toys, Ratchet's biggest difference from Ironhide is a top-mounted light bar. TakaraTomy tried to be as authentic as possible with the use of both chrome and clear plastic to represent the rescue signal. Together with Prowl, you've got a nice little representation of Japanese public service vehicles circa the early 1980s. The light bar itself rests on a little spring mechanism so it can push down for the requisite "fit inside MP-10's trailer" gimmick. And, like Ironhide, you can store Ratchet's dual pistols next to his rear wheels. Ratchet's transformation is just as tight and satisfying as it was on Ironhide (check my video review to see it in action). Seriously, between the two figures I must have done this conversion dozens of times and it remains one of my favorite bits of TF engineering ever. What makes it so satisfying is how every bit of the toy has a clear destination, with the contrast between the two modes making for a very palpable goal during play. The only thing you really have to be aware of with Ratchet is making sure his distinctive head chevron doesn't knock against his feet. As a remold of Ironhide, Ratchet also stands a good eight and a half inches tall, making him one of the larger Masterpiece Autobot Cars. True to the series, he is far more uniform in color than his fellow van robot. As such, the mold's infamous posterior tires stand out more on Ratchet than they did on Ironhide, but the white hip plates blend in better next to the same-colored thighs. Also, I wish TakaraTomy had gone with another color for all the necessary screws, as these black ones are a bit of an eyesore. Masterpiece Ratchet has a good head sculpt, with his simple white helmet and prominent dark gray chevron taking center stage. His face, on the other hand, is just alright. While I feel Ratchet doesn't quite nail the character's look in the same way MP Ironhide does, it's far from being terrible. I think the face would look better if Ratchet's neck was painted in matching gray, like with Ironhide. Griping aside, I do enjoy this alternate smiling face plate. I can definitely hear Ratchet's distinctive laugh coming out of this grinning mug. And it definitely helps the friendly doctor bring the sass. Ratchet and Ironhide look really good together, with each toy carrying its own personality that belies their shared mold. In keeping true to each Autobot's character model, Ratchet and Ironhide have more differences between them than just their heads. First off, the good doctor has a different pelvic region, featuring a pair of movable skirt flaps. Second, Ratchet lacks the extra detailing around his knees that is present on Ironhide. All these things were put in to help artists and animators distinguish the two. You can find similar detailing tweaks on other characters who share a base toy, such as Prowl and Bluestreak. Cosmetic changes aside, Ratchet is still a very solid figure in robot mode, and he can pull off that sweet jump kick seen in the episode "Changing Gears." It's been about four years since Masterpiece Autobot cars started coming out, and the crew is shaping up quite nicely. Ratchet comes with the same facsimile of the G1 figure's detachable repair platform, which actually appeared (briefly) during the first episode of the show's pilot. You may have noticed that Ratchet comes with a lot more guns (or gun-shaped medical tools) than Ironhide, which makes his platform look a bit more intimidating. "Since you're in my office more than most Autobots, Sideswipe, I think you'd be the perfect test subject for my Medical Missile!" "Uh... gonna have to pass on that, doc." A few of the accessories are repeats, like the chrome-plated Static Laser Gun. And like Ironhide, Ratchet comes with two of the small laser pistols he was seen using when the Decepticons attacked the Autobot shuttle in Transformers: The Movie. Ratchet is also packing this neat looking X-Ray Blaster, which is seen only once in the series. While the design is most likely a gaffe derived from the toy's gun, I appreciate TakaraTomy using it to add variety to the toy's accessories. When the doctor needs to start fixin' things, Ratchet can wave around a Magno-Wrench (left) and Cyber-Spanner (right). He actually comes with two examples of the latter, so you know he's a serious car mechanic. "Next time you'll know not to try arm-wrestling a Stunticon!" "And it's the last time I let Sideswipe talk me into anything." "Hey doc, I got this weird squeak in my neck. You think you can check it out-HURK!!" "Hold still or I'll give you Cyber-sedation." "Whoa! Not so rough, doc!" For more delicate work, Ratchet comes with no less than three(!) fancy gadgets. You can attach a small Repair Beam Emitter to either wrist, a large Arc Welder on the tab left by his retracted fists, or give Ratchet a Laser Scalpel to hold. All of these accessories can use the included beam effect part for some Cybertronian tune up adventures. And, like Ironhide, Ratchet includes a cardboard insert for his chest window. This time it's an EKG style display for true TV doctor experience. "Heheh, don't worry lil' buddy! I'll get this reattached nice and tightly." "Yeeowch! You don't have to set that thing to 'deep fry', Ratchet!" "There we go. Now let's see if these old diodes can still transform." "Nothing worse than an arm that won't transform right, eh Ironhide." "Awww quit yet yappin' and fix me up!" And if you have both Autobot vans, Ratchet can become a very heavily armed medic. Now. you may have noticed that Ratchet lacks his usual Red Cross markings, and there is a good reason for that. Since the logo is in fact trademarked, TakaraTomy chose to avoid legal entanglement by providing two types of alternate logos in the form of stickers. One set is the red cross with an Autobot logo in the middle, as seen in Masterpiece Ratchet's promotional photos. The other is the red cross with four little squares around it. While I understand this led to some fans crying foul, this is just one of those things that is out of TakaraTomy's hands. 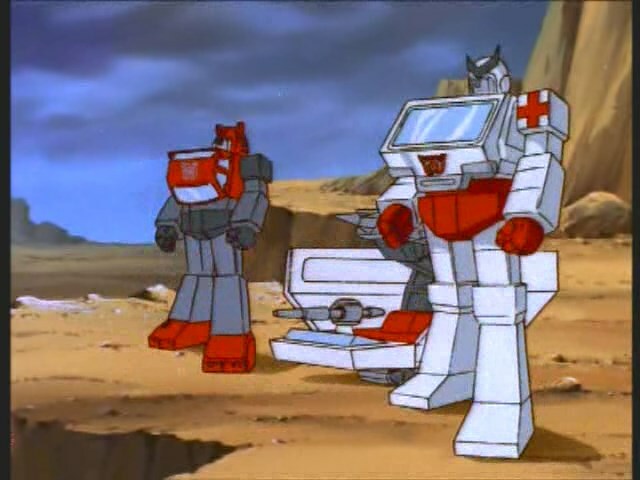 In fact, it turns out Transformers was violating the Red Cross's trademark even back then, it's just that the ubiquitous organization wasn't as aggressive in prosecuting offenders. Of course, so long as you have a good cutting implement and a steady hand, Ratchet can have his classic G1 'toon look in a matter of minutes. Like Ironhide, Masterpiece Ratchet is a top-notch Transformer. His quality is every bit as good as his mold mate, with TakaraTomy's attention to detail making both figures feel like a worthy purchase. Although, I must admit, given the chance I would gladly get this toy again if they decided to do a Marvel Comics version. The old redhead is burned into my brain just as much as the cartoon version, if not more, and I know for a fact that a lot of fans have the exact same sentiment. Party ambulance for the win! I've seen a few people complain about QC issues, so it's nice to see one that's got none. I'm not sure if I like MP Ironhide or Animus more, but you're right in that he's a satisfying figure to handle. So I'm looking forward to ordering Ratchet next weekend with either UW Bruticus or Victorion.